1864: Is There Any Justice for the Black Man? The New Orleans Tribune was first issued on July 21, 1864. The Tribune pursued the same reforms as its predecessor L’Union, but its English section targeted a far wider audience, including freedmen and Northern readers. The paramount mission of the journal was to unite all black men as brothers in the struggle for of universal suffrage. The issue of limited versus universal black enfranchisement had been the source of vigorous debate within black and white radical circles, both locally and nationally. The suffrage petition delivered to Lincoln in March initially included the right to vote for all of African descent. But the document was changed at the recommendation of local white radical Unionists who believed a limited franchise would be more viable. Charles Sumner and other Radical Republicans in Congress urged otherwise, and the petition was amended and returned to its original intent just two days before being presented to the president. Nationally, the Tribune followed the October National Convention of Colored Men and its formation of the National Equal Rights League.. Under the leadership of Frederick Douglass, 144 delegates from eighteen states, including Tribune ally James Ingraham of Louisiana, met in Syracuse, New York, and crafted a platform for citizenship and black voting rights. The Tribune supported the League’s plan for the creation of state and local branches. Locally, the Tribune reported on frequent and well-attended political rallies held in the black community. In December, the newspaper issued a series of editorials calling for the creation of a New Orleans branch of the National Equal Rights League. In December, the Tribune editorial “Is There Any Justice for the Black Man?” condemned the acquittal of a white man for the murder of a black in New Orleans. Widely read nationally, the story greatly boosted the newspaper’s reputation. 1865: We Have to Stand Our Ground! 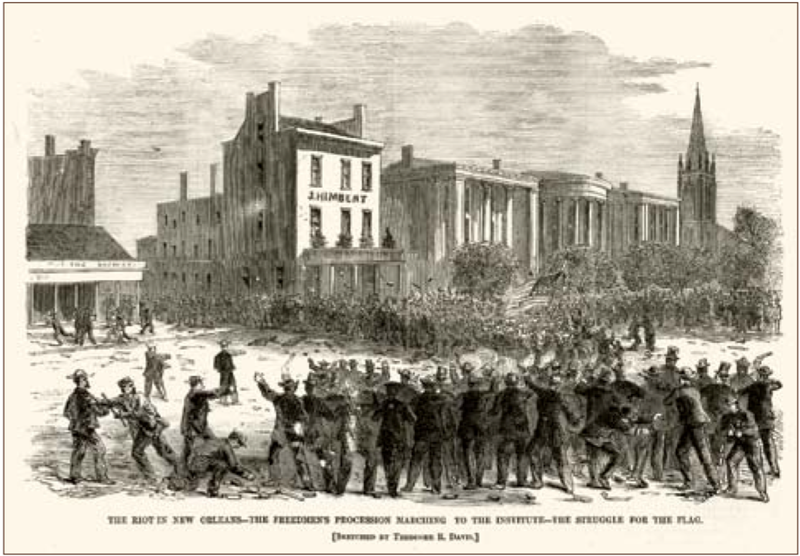 Black leaders in New Orleans, newly energized by the 1864 gathering in Syracuse, met in January as members of the National Convention of Colored Men and established a chapter of the National Equal Rights League. Serving as its official organ, the Tribune issued a series of reports covering League meetings, praising the spirit of unity between free and freedmen that emerged. In June, The Friends of Universal Suffrage was formed in New Orleans. This new organization, also closely tied to the Tribune, was a coalition of black National Equal Rights League members and white radicals. The Friends advocated universal education, black suffrage, and land distribution to the freedmen. That fall, the Tribune and the Friends organized two voluntary elections in order to demonstrate the fervor with which blacks would go to the polls. Blacks first voted in September for delegates to the upcoming convention of the Friends of Universal Suffrage. A second voluntary election for a territorial representative to Congress was held in November, with over 19,000 unofficial ballots cast. This simulated enfranchisement was a powerful display of black power and a huge symbolic victory for the Tribune. In late September, the Friends of Universal Suffrage combined with the moderate, interracial National Union Republican Club, becoming the Republican Party of Louisiana. Initially, the Tribune favored an alliance of the groups, not a merger. However, the newspaper quickly perceived the political advantages and endorsed the merger, becoming the party’s official organ. Black labor was the central issue in the restoration of Louisiana’s agricultural economy, and the Tribune relentlessly argued for black land ownership and economic self-sufficiency. In early March, the Freedmen’s Bureau was established to provide the plantations with workers. The Tribune issued a series of withering attacks on the free labor schemes of Union policymakers and the Freedmen’s Bureau. The Bureau exerted great control over Louisiana’s formerly enslaved laborers, holding them to one-year contracts and confining them on the land they worked. As a viable alternative to this form of serfdom, the newspaper advanced the cause of the Freedmen’s Aid Association. The Association was briefly successful, although on a small scale. Under its direction, almost 700 freedmen became independent workers on four mid-sized plantations. With the end of the Civil War in May, defeated ex-Confederates returned home and were surprised by Louisiana’s accommodating government. The North was in a position to impose policies establishing equality, but instead worked to rebuild white political and economic stability. As a result, Southerners accepted defeat without repentance, emancipation without equality. Pardoned white Louisianans became the electoral majority by a large margin, and unsurprisingly, almost all of the state legislators elected in November were Democrats or ex-Confederates eager to establish a government for the exclusive benefit of the white race. This legislature immediately passed new and restrictive black codes. The old political landscape had been re-created. The Tribune, the Freedmen’s Aid Association, and the Republican Party of Louisiana would have to regroup and develop new strategies for black political participation. 1866: The Tribune is the Rostrum From Which the Oppressed May Be Heard! Despite the local Republican electoral setbacks in 1865, events in Washington were now more encouraging. The Tribune’s coverage of the new racial codes was picked up by many Northern newspapers, which aroused opinion against Louisiana’s rulers. The attention to the situation in Louisiana helped the Civil Rights Act of 1866 pass Congress over President Johnson’s veto. The Act declared all men born in the United States to be citizens. Although its provisions were largely ignored or undermined locally, the outlook for the Radical Republicans was improving in the nation’s Capitol. National progress continued in June, when Congress passed the Fourteenth Amendment, guaranteeing the provisions of the Civil Rights Act, regardless of race. Still, the Tribune demanded far more for blacks than the Civil Rights Act and the Fourteenth Amendment provided. Citizenship was important, but the central issue of suffrage remained unresolved, and the newspaper continued its campaign for the black vote. To that end, the Tribune cautiously supported a plan to reconvene the Louisiana constitutional convention, which had adjourned in 1864 with provision for reassembly. On July 30, a group of mostly black Republican delegates restarted the convention hoping to approve a universal suffrage plank in the state’s next constitution. Held at Mechanics’ Institute, a typically large crowd of black spectators was present as well. The gathering was attacked by an outraged white mob that included police and firemen, and many blacks and a few white supporters were brutally massacred. Tribune editor Jean-Charles Houzeau witnessed the bloodbath and heard the assassins shout “To the Tribune!” He claimed the newspaper was saved by a detail of black soldiers. Louisiana was clearly incapable of reconstructing itself. 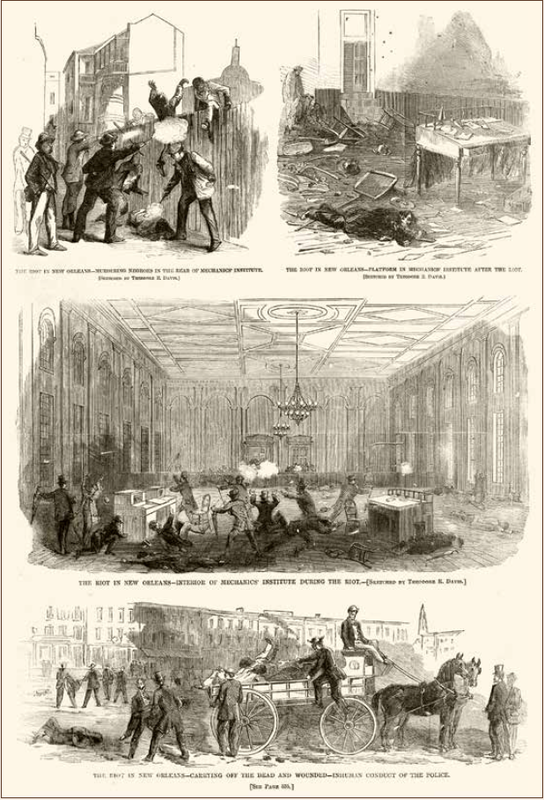 The Mechanics’ Institute Massacre became an enormous national news story, tipping the fall congressional elections heavily in favor of the Radical Republicans and significantly damaging President Johnson’s lenient Southern strategy. Learn more about the Mechanics’ Institute Massacre in our virtual tour of historic sites related to the New Orleans Tribune. 1867: Everything Depends on the Colored Vote! The Tribune provided extensive coverage of the new Republican controlled Congress, which wasted no time in passing four aggressive Reconstruction Acts. Louisiana was treated like a conquered enemy, and for the state to be re-admitted to the Union, it had to follow the new mandates, including sanctioning the black vote. In the spring, state officials refused to go along with the new order of things and were summarily replaced by General Phillip Sheridan. The Tribune cautiously supported the provisions of the Reconstruction Acts, but also assailed the absence of black voter registrars in the new system. The Tribune renewed its campaign to integrate the New Orleans schools and strengthened its call for black representation in political office, the jury box, and the voting booth. In May, the newspaper reported on a racially charged week of large-scale demonstrations and sit-ins by blacks that resulted the end of streetcar segregation in the city, long a Tribune goal. The Tribune reported on the numerous meetings of the Republican Party of Louisiana, which was dominated by the newspaper’s radical allies. In June, the party held its convention. A power struggle ensued, and the Tribune faction lost control of the powerful Central Executive Committee to moderates under the leadership of Henry Warmoth. The newspaper’s supporters did succeed, however, in establishing a radical platform and a guarantee that half of all delegates nominated to the upcoming state constitutional convention would be black. In August, black registrars registered more than 82,000 black voters. The dream of universal suffrage became reality in the September election. The overwhelming majority of more than 75,000 voters were black men, this time participating in an official election. Half of the delegates elected to the constitutional convention were of African descent, both those formerly enslaved and free men of color alike. Veteran activist delegates included P.B.S. Pinchback, Arnold Bertonneau, and James Ingraham. On November 23, the Louisiana State constitutional convention assembled. The Tribune enthusiastically covered the entire four-month gathering, while the rival New Orleans Times dubbed it the “Congo Convention” and sought conservative unity to end it. In spite of these hostilities, delegates began framing a radical Bill of Rights that would satisfy Reconstruction mandates and guarantee universal male suffrage. 1868: The Constitution is Entirely in Our Direction! In early January, Republicans held nominating conventions to slate local and state candidates for the April election. The Tribune’s “uncompromising” radical faction originally supported Thomas Durant, a Southern white radical Unionist, for governor. Durant declined the endorsement. The newspaper subsequently endorsed former black military officer Francis Dumas, who received the most votes on the first ballot, but was four votes short of the required 45. On the second ballot, Henry Warmoth, a white carpetbagger deeply distrusted by Dr. Roudanez, defeated Dumas by two votes. Radicals claimed votes were stolen. Dumas refused the nomination for lieutenant governor, which was then accepted by Oscar Dunn. Roudanez and many Tribune loyalists were still angry at Warmoth’s takeover of the Central Executive Committee in 1867, and were furious at an election they believed rigged. Roudanez rejected the Warmoth candidacy. Instead, his faction slated their own candidates, James Taliaferro and Francis Dumas. The Tribune’s repudiation of the Republican nominees proved costly. Houzeau resigned as editor, believing the Taliaferro candidacy to be illogical and divisive. Rebuked by the Republicans and delisted as an official newspaper of the U.S. government, the journal was suddenly without political power and financial support. The Tribune ceased regular publication on April 25. It came out later in the year, then continued until March 1869. 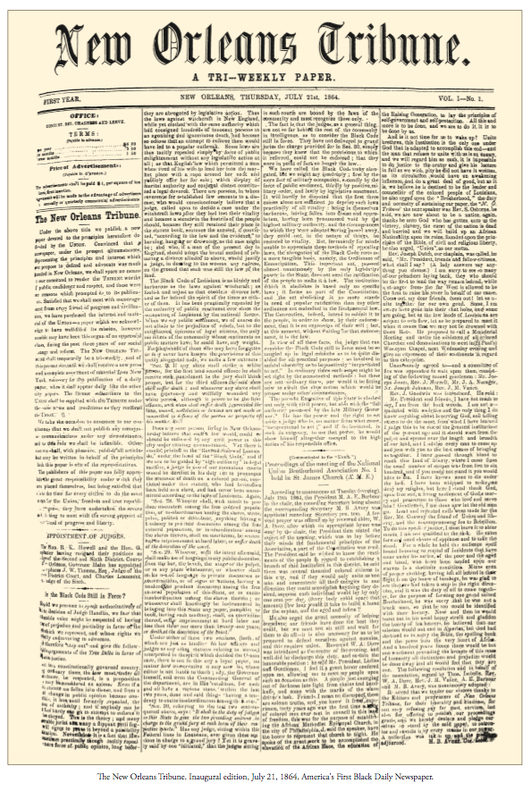 The last issue, a weekly edition, appeared in early 1870. The political achievements of the Tribune were not lost. The biracial Louisiana state constitutional convention adjourned in March and delivered a groundbreaking blueprint for the state’s future. The proposed constitution was the first in Louisiana history to include strong civil rights provisions and the most radical of the Reconstruction era. It contained almost everything the Tribune had campaigned for: universal male suffrage, equal rights, citizenship, integrated public schools, Confederate disenfranchisement, racially proportional representation, and abolition of the 1865 black code laws. Additionally, the newspaper’s call for biracial public education was realized, and by 1874, as many as nineteen integrated schools had been created. In April, voters ratified the new constitution, and Warmoth was elected governor. As Dr. Roudanez had predicted, Warmoth proved to be a self-serving ally of conservative Republicans and moderate Democrats. The new governor vetoed any legislation that would have enforced the civil rights and public education provisions of the state constitution. On the other hand, Louisiana’s first mixed-race legislature was elected, and black legislators would continue the fight for several more years. By 1874, militant white Democrats and their violent White League supporters were in control of the state government, and the dream of racial democracy vanished in a relentless nightmare of Jim Crow terror. New Orleans Tribune, September 8, 1864; November 15, 1864. On the history of the petition, see Caryn Cossé Bell, Revolution, Romanticism, and the Afro-Creole Protest Tradition in Louisiana, 1718-1868 (Baton Rouge: Louisiana State University Press, 1997), 248-52. Tribune, September 9, 24, 1864; October 22, 1864; December 9, 1864. Tribune, November 10, 12, 1864. Joseph Logsdon and Caryn Cossé Bell, “The Americanization of Black New Orleans,” in Creole New Orleans: Race and Americanization, ed. Hirsch and Logsdon (Baton Rouge: Louisiana State University Press, 1992), 231-232. Tribune, October 25, 26, 28, 1864. Tribune, January 8, 15, 17, 20, 1865. Tribune, June 1, 30, 1865. Tribune, November 5, 7, 1865. The Tribune devoted extensive coverage of these first black elections. See issues between September 27 and November 7, 1865. Tribune, January 28, 29, 1865; February 2, 7, 1865. Tribune, February 23, 24, 1865; April 4, 11, 30, 1865. Tribune, May 2, 28, 1865; July 11, 1865; August 8, 10, 1865. Joe Gray Taylor, Louisiana Reconstructed, 1863-1877 (Baton Rouge: Louisiana State University Press, 1974), 96. Tribune, August 31, 1866; September 1, 11, 13, 20, 1866. Jean-Charles Houzeau, My Passage at the New Orleans “Tribune”: A Memoir of the Civil War Era, ed. David C. Rankin and trans. Gerald F. Denault (Baton Rouge: Louisiana State University Press, 1984), 159. Gilles Vandal, The New Orleans Riot of 1866: Anatomy of a Tragedy (Lafayette: University of Southwestern Louisiana, 1983), 212. Tribune, April 21, 26, 1867; May 9, 1867; July 9, 24, 1867. Tribune, August 10, 1865; May 5, 8, 11, 1867. Tribune, July 3, 20, 1867. John Rose Ficklen, History of Reconstruction in Louisiana Through 1868 (Baltimore: Johns Hopkins Press, 1910), 193. Charles Vincent, Black Legislators in Louisiana During Reconstruction (Carbondale: Southern Illinois University Press, 2011), 69. See also: Logsdon and Bell, 249.